We have the good fortune to live about ten minutes from the Pacific Ocean in Santa Cruz, which is at the North end of Monterey Bay on a lovely piece of California coastline. 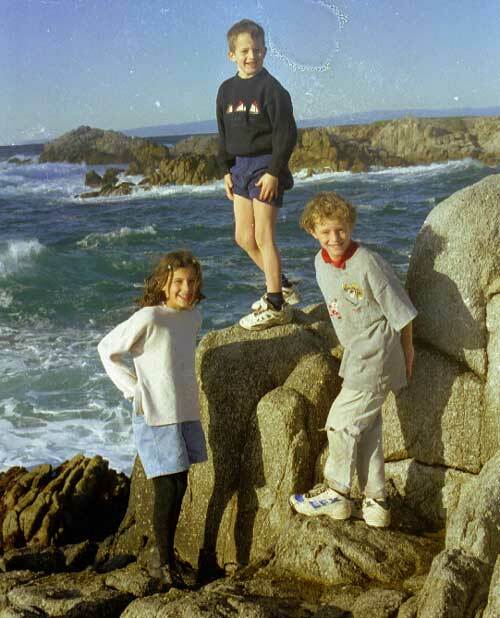 One of the places that we drove to on Sunday afternoons, more frequently when the older children were younger and accompanied us more regularly, is the Monterey Peninsula at the South end of the Bay. It is home of Steinbeck's "Cannery Row" (the world's best portrait in words of a party), the charming village of Carmel, where Clint Eastwood was Mayor for a time, Point Lobos State Park and the rocky headlands of Pacific Grove. 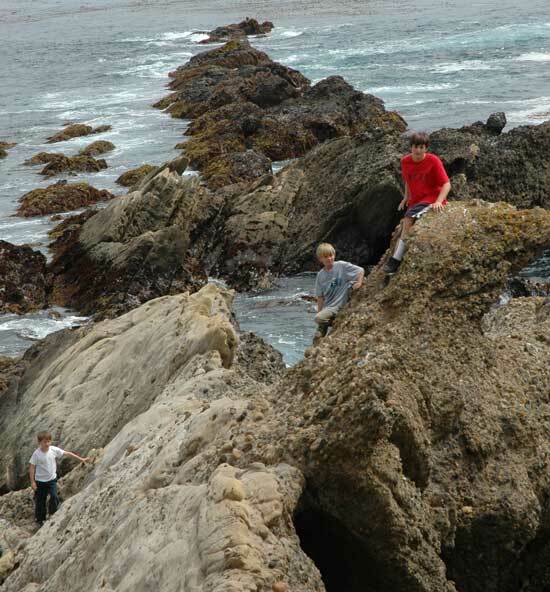 A typical Sunday afternoon would include the parents window-shopping and café-ing in Carmel, and the children rock-scrambling in Pacific Grove. The negative on the left has suffered a bit (all of the negatives in this roll have been through the wars) but these first photos were taken in December 1997 during Nick and Tom's first visit to us in California (see here). 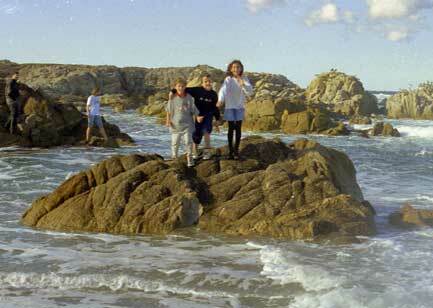 Daphné, Tom and Alban were scrambling on the Pacific Grove rocks while Nick slept off his jet-lag in the car. The rock scramblers were having a blast! They spent most of their time jumping on and off this "island", as it was more and more surrounded by the rising tide. Here are other pictures taken at the same spot, one of Daphné and one of Tom. 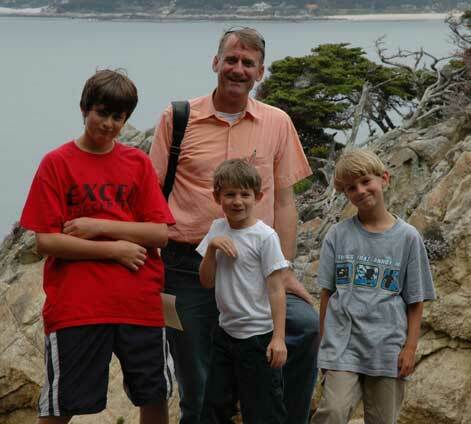 Jumping forward to 2004, for a visit to Point Lobos State Park, a gorgeous slip of coast just south of the Monterey peninsula. We visited with an older and bigger Tom as well as Charlie and Alex, and with the new digital camera to avoid problems with negatives. 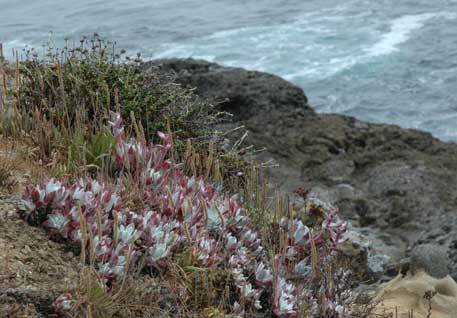 These flowers on the left were growing just above the rocky shore and the surf. Here are the walkers, except for Marie-Hélène, who took the shot. And here again is the inevitable rock scrambling, which still evokes as much excitement as it did years ago when they first discovered it.  Alex is down at the bottom left, Tom on high, relatively speaking, and Charlie between the two. Here are other Santa Cruz highlights: surfing, soccer, mountain biking, West Cliff, swimming, more soccer, the Boardwalk and Happy Valley School.